Late Nite season is here again. 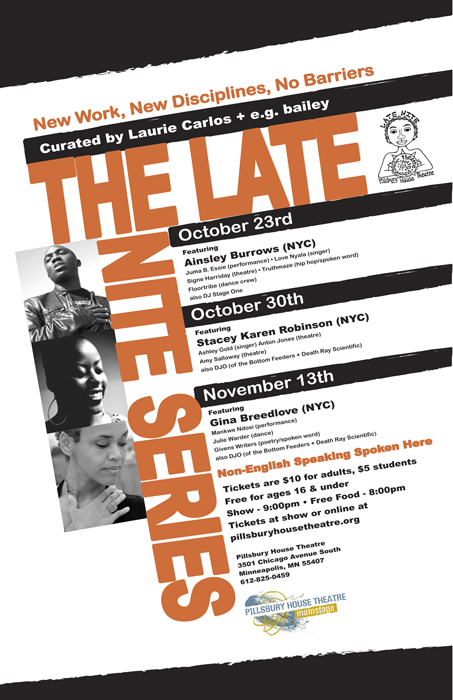 Those that don’t know, the Late Nite Series was created by Laurie Carlos as an experimental stage for artists to share everything from fine-tuned work to works in development, from solo musings to full band sets. I co-curate the Series with her each year. The great thing about the Late Nite Series is that it’s such a unique blend of disciplines, all in one evening. You don’t always know what you’re gonna get at Late Nite, which is part of the excitement, but you can be assured that it will be a one-of-a-kind show by some of the best artists in their field, both in terms of the headliners and the Twin Cities artists. There is singer, gina Breedlove, who has shared the stage with Harry Belafonte, and was in the Broadway production of the Lion King. Ainsley Burrows is one of the best spoken word artists working with music today, and has appeared on BET, performed for MTV, opened for artists such as Toots + the Maytals, Capleton, Third World, in addition to traveling internationally. Stacey Karen Robinson is creating a buzz in the theatre scene in NY, both as a playwright and an actress, and is the recipient of a BRIO Award in Playwriting. You won’t get a headlining series like that anywhere else in the Twin Cities. To top it off, these New York based artists are paired with Twin Cities artists that put on great shows in and of themselves, including premier hip hop and spoken word artist, Truthmaze; singer songwriter Ashley Gold; vocal and theatre experimentalist Mankwe Ndosi; actress and playwright Signe Harriday; Hmong hip hop dance crew Floor Tribe; performance artist Amy Salloway; choreographer Julie Warder; theatre artist Anton Jones; videomaker and performance artist Juma B. Essie; and singer Love Nyala. This is just to name some of the artists appearing in the series. The performances are rounded out by DJs Stage One and DJO.